On the eve of Apple’s iPad related event on Wednesday, the company added a new Catalogs category in the App Store. It’s not often Apple adds new categories in its applications tore, and the new section could be linked to features on the new iPad, dubbed either iPad HD or iPad 3. Dozens of apps have now been moved from the Lifestyle category to Catalogs, including Catalog Spree, the first app to move, spotted by AppleInsider late on Tuesday. Other notable additions to the section include Catalogs.com, Saks, Toys R Us, Ikea, Nordstrom and Google Catalogs. It’s still unclear if there is any link between the new category and the upcoming iPad, which should be introduced later on Wednesday at a special event. The new iPad is expected to come with a high-resolution Retina display, which would only improve the appearance of interactive catalogs designed for the device. A study last year found that record numbers of consumers are already shifting their shopping from PCs to mobile devices, as mobile sales as a percentage of total online shopping sales continue to increase. Dedicating a section in the App Store to catalog shopping apps would further boost people ditching hefty catalogs in favor of its iPad counterpart. Google is also making a foray into catalog shopping. 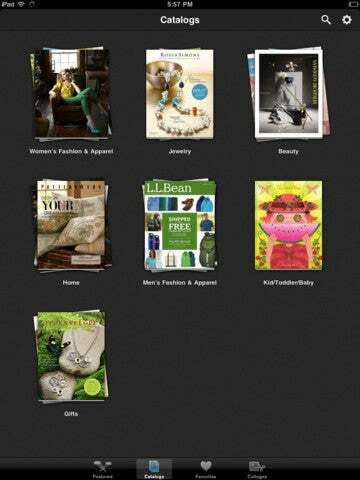 The company introduced last August Google Catalogs, a free tablet app that contains many popular catalogs. There’s no integrated shopping experience in the app, but each catalog has links to the merchant’s website or when you could find it nearby.